October 29, 2013 October 29, 2013 Posted in Travel Posts. For the last few days I have been in Kagoshima after finally getting away from the farm in Hiroshima, now it may appear as if I hated that farm and the person who ran it but the truth is I cannot hate either I can only feel sorry for them but I am glad to be away from that situation. 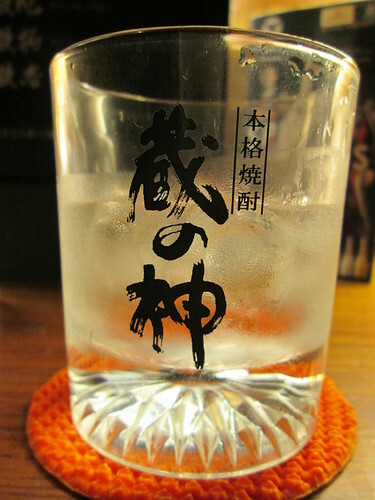 Kagoshima is like the originating place for Shochu, a spirit made normally from sweet potato, it’s like the Japanese equivalent of Vodka with about half the percentages, I have seen shops in Kagoshima with literally hundreds of different types of shochu. I have been staying in a little pace called the Green Guest House which I booked via Agoda that runs a cubicle like affair for ¥2000 a night. The staff were very friendly, helpful and nice people so thank you to them for making it a good experience. The hostel is very close to the city centre, sights and the harbour so you can easily jump on a boat over to one of the islands or even all the way back to Osaka. I came here for a few reasons, I wanted to go to the home of where shochu started was one of them, it’s one of the things I like to do is go to the place where things are supposed to of originated and experience them there. I am sure you can find the same product outside of the area but there is something about going to a place where a thing originates for me.The second reason was to see if a rumour was true, it has been said that Japanese people in Kagoshima are some of the friendliest in Japan which might have something to do with the amount of shochu that is consumed there. However from the experience over the last few days I have not noticed the people being overly friendly just the normal standard that I have found throughout Japan. A third reason is one of nature, Kagoshima has an abundance of Onsen’s and more importantly for me is Sakrajima, the island just off the south coast. 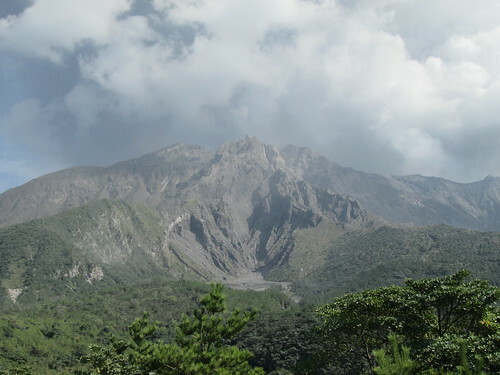 Now if you have been following for a while you will know how much I love to feel the awesome power that is nature, maybe there is a bit of Pagan in me or something that I love to soak up what mother nature has to show me and Sakurajima has an active volcano. 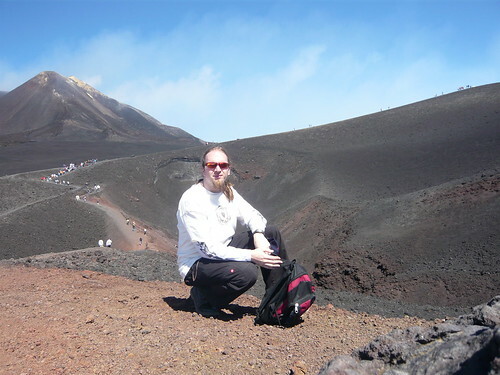 I have been up a volcano before a long time ago when I visited Sicily and climbed Mount Etna (photo above) which although was not easy it was a memory I am going to have forever. I was hoping that I would be able to climb a bit up the mountain but the Japanese do not allow you to do this. Maybe there was a way to do it but I try not to go against the wishes of people who live in the place (like when I did not climb Uluru). But still there is a nice 15 km walk around a bit of the island which I did about half of. It takes in a pretty area and even a foot spa if your feet are suffering a little. If you are feeling adventurous you can take a bucket and spade down to the beach and even make your own foot spa just by digging in the sand and the water you will find is heated by the springs probably caused by the volcano. After an approximate 7km walk I got to the main observatory at 323m above sea level (if your feeling lazy, pushed for time or unable to walk the there is a bus too) and there you get to see the mountain a bit closer and you can definitely see the ash pluming out of the crater at the top. Your probably bored of me saying that it’s awesome to be in the presence of something so powerful and natural and if you are quit reading now because I am going to get all philosophical on you (again). For me it’s a healthy mixture of fear with awe and wonder. The mountain has not had a big explosion since 1914 so I would assume that it’s fairly stable but I am not sure how much you can guarantee that. It’s at this high point I once again came across the strange things that tourists tend to do in these situations. Because of the ash (I suppose) a lot had put on these breathing masks which I am sure do very little to help keep the ash away from your lungs, the one’s who arrived by bus hurried off the very busy bus, stood in front of the mountain, performed your stereotypical asian pose and then quickly retreated to a ‘safe’ distance. This particular behaviour I am sure I have said just how much it confuses me and it’s because I believe take a slightly different approach to this. I took some time to stand and stare and give myself the time to actually be in the place, be present in the space that I occupy at that point in time. I did warn you I was going to get philosophical it even sounds vaguely religious when I write it or say it. I think that half the time as humans we spend so much time getting to places we often rush through them just to say “Been there, done that” and really we have not been there, we have not given ourselves the time to realise what we are seeing, where we actually are and appreciate it. I leave this post with a video I made of the mountain and an explanation of the hand signals I have noticed Japanese people using when either explaining something to me or just in their general day to day life. Maybe you find it useful if your coming to Japan. If your reading via mail you should select the following link, otherwise as per usual the video is below.